I recently figured out how to control my Blinds.com motorized cellular shades (http://www.blinds.com/control/product/productID,97658) with my Vera 3. The blinds have Dooya DV24CE motors (which use a 433 MHz RF for remote control) built into them but I couldn't find any already built RF transmitter that integrated directly with the Vera. I had recently started building Arduino sensors with Henrik's amazing MySensors Arduino Sensor Plugin (http://www.mysensors.org) so I decided to try to build my own. Thanks to many helpful resources on the internet I was able to control my blinds for less than $20 in Arduino parts. Thanks for the guide and Arduino sensor example @petewill . Really fun to read about how you sniffed the radio signal from your blinds! I had no idea it would be that "simple". I am working on an updated version of this code to include multiple remotes as well as send status back to Vera. I have the multiple remotes code working well but I'm running into problems updating the status. I don't think I'm understanding how to properly send an update to the S_COVER sensor type. I have read the API instructions 2 or 3 times but I'm not a coder so I'll admit I don't fully understand it all. I think that I should use this code to update the Vera: "gw.sendVariable(message.header.childId, V_UP, 100)" but it's not working as I thought would. Should I maybe be sending a 1 instead of a 100? Or, something else? When I look at the advanced settings the LoadLevelStatus is 100 when the blind is up (done through web interface) so I think sending 100 is correct. Maybe I should be sending it as a different variable like V_Dimmer? Here is my code where I'm sending the status back to Vera. Thanks! UP/DOWN/STOP is commands and does not have any values associated with them. And yes, LoadLevelStatus is updated by setting dimmer value. Excellent, thank you! Now to make some code changes and test some more. Ive some blind motors on the way..they are not RF though..so don't think ill need to decode the RF but thanks for the video explaining how it is done! @gregl You're welcome. I have received much more help than I have given but I do try to help when I can. Thanks for your posts as well. This community is great! Is three anyway to copy a ROLLING code? petewill Admin last edited by @C.r.a.z.y. @C.r.a.z.y. Not sure but I'm guessing it wouldn't be as easy as this since it is used for security. I would guess there is some key that it uses to generate the codes and you would need to figure that out. All just guesses though. great to see the update... gives me another thing to do! @petewill Thank you Pete. I tried this code and found 9 devices. I changed 433 codes but didnt work. Before mySensors how can i test the 433 code if it works or not? @C.r.a.z.y. This code is designed specifically for my blinds. You will need to modify it for your outlets based on the pattern of the code that is being sent. I took a look at your audacity file but I'm not exactly sure what I'm looking at. Did you press the On button 3 times then the Off button 3 times? As far as testing, what I did was just start with one command (On or Off in your case) and put it all in the loop function. Just put it an if statement so it only executes once. It will execute once when you plug in the arduino. Then you can get it sending the right codes correctly and not worry about the Vera setup. @C.r.a.z.y. Also, I forgot to mention this in my post above but you may want to consider making outlets with HEKs sketch. That's what I ended up doing because then I could see the status. With the RF stuff you can only send a signal but you don't get an acknowledgment as to if it worked or not. EDIT: I made my own outlets using HEKs relay sketch. That's how I see the status. I didn't end up using RF for outlets although I had originally planned to. I realized I wasn't very clear in my post above. @petewill thank you Pete. I will try to modify at least i will sent rf code. Yes audocity file pressed 3 times on + 3 times off.. I think these are not the same with youtube video? I read one of my remote with RC-Switch but other remote didnt work with RC-Switch. How can i convert this data to 32bit? @C.r.a.z.y. I am doing my best to understand but I think I'm still missing something. Basically what you want to do is to reproduce the pattern you recorded in Audacity. I did this somewhat crudely with blindAction function (someone smarter than me could code it much better but it works). You will need to modify (and probably rename) this function to meet your needs. In this function I call other functions (fourBits and eightBits) to actually send the RF signal out. I would start with these methods to get your timings right. You can then record what you send out in Audacity and compare. After you have got this working with one command you can work on interfacing it with Vera. I hope that helps a little. @petewill Thank you i know you are very helpful. I tried to copy my remote to an universal remote learner(which has no name chipset) but it didnt copy. It is hard to understand and solve for a newbie. I simply tried to send 10101010codes with this sketch https://code.google.com/p/rc-switch/wiki/HowTo_Send?tm=6 and didnt work. If i remove the delay () than signal is always sent. I made a jammer! Any of my 433 remotes didnt work! I want to learn if any universal remote learner with EV1527 Chipset works with RCSwitch? My plan is to copy some remote codes to EV1527 universal remote and read the code from serial with RCSwitch-rfSniffer. Now i will try IR SENDER-RECEIVER http://www.mysensors.org/build/ir maybe i can get new ideas for 433mhz things..
@C.r.a.z.y. Yeah, I couldn't get the automatic "sniffers" to work for me either. Hopefully you're able to get it working. Remember, just focus on sending the 1's and 0's pattern. Start your code with that then expand when you get that part working. One thing that may help is to record what you're sending in Audacity again. 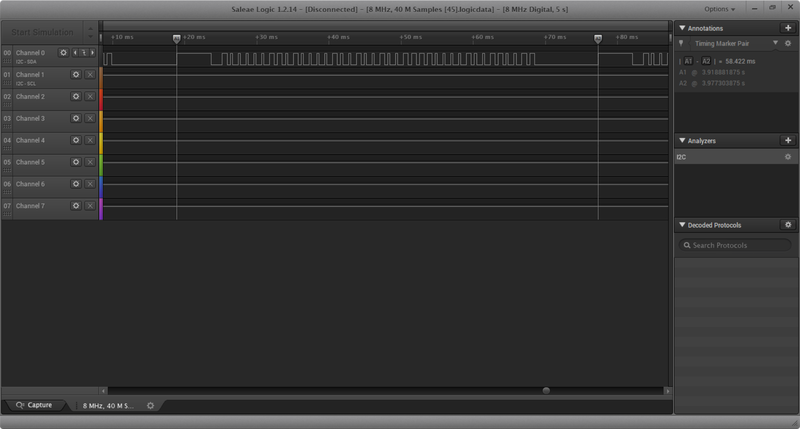 That way you can compare the waveforms and see what needs to be modified with the code. @petewill Comparing is great idea thanks i will try this! Just another way of doing what you're trying to do, but this way you will get the status reported instead of just hoping the outlet turned on. I'm trying to do the same but my RF code is different. The number of bits is the same. I have first 20 bits witch I can set for remote 1;2;3 but the last 20 bits depands on command. I delete remote1Bits4, and channel (child_Id) and add eightBits action1;2;3 for up\down\stop But it dont work. Could you check this code changes, please? //  version 2 as published by the Free Software Foundation. //  signal. The motors in the blinds are Dooya DV24CE motors. //  sending the RF signal. //  Developed by Pete B. // or set to AUTO if you want gw to assign a NODE_ID for you. //in remote(). This is referred to as the blindNumber in remote(). //distinguish between the different remotes. //sequence. They will be ignored later in the code. //anything when you buy more blinds. Just add the additional remote codes. unsigned char remote1Bits1 = 0b00001100; //integer value of the 28 bit standard sequence referenced above. "0b" prefix is for ?? unsigned char remote2Bits1 = 0b00000100; //integer value of the 28 bit standard sequence referenced above. "0b" prefix is for ?? unsigned char remote3Bits1 = 0b00001110; //integer value of the 28 bit standard sequence referenced above. "0b" prefix is for ?? if (remoteNum == 1)  //Which remote will be used? @tjay4x4 sorry for the delayed reply. Are you using blinds.com blinds or something else? This code is written specifically for my blinds.com (dooya motors). They have a sequence of very specific codes that I reproduced with the blindAction method. If your remotes have different sequences you will need to modify the code there. If you are using blinds.com blinds, maybe they changed the sequences? Also, do your up/down/stop commands look the same as mine? @petewill Thank you for reply! 1 solder relays to remote buttons. In this case I destroy remotes. Or order another 3 remotes for donation. 2 ask somebody to change this sketch for a fee. It's better, but who can? @tjay4x4 I think you will find many helpful people on this forum. If you are willing to learn a little about coding there will be people to help. I have been helped many times with coding questions. SEND_DATA is the digital pin on the Arduino (defined above in the code) and the highTime/lowTime is how long it will remain high and low. You could literally do that for each 1 and 0 that is in your signal to make sure you have it correct. Once you have that down you can begin breaking it down into methods and patterns like I have..
@tjay4x4 How did you determine what your codes were? Did you use a RF library or did you 'sniff' them directly? @petewill Thank you! Actually I dont trying my code just on arduino. You mean it could be different high and low time for 1 and 0 on my code. Well, then I went to check. How did you determine what your codes were? Did you use a RF library or did you 'sniff' them directly? I used Audacity. As written in the instructions. For each button sequentially rewriting the code. Comparing them with Blinds.com it became clear that the differences in the combinations of digits. If in the original, the first 28 are the same, I have to differ for each controller first 12 digits and last 12 digits. UP, DOWN, STOP bits are the same for all remotes. The question is how to write it to this code? But first I need to check High and Low time. Here is some sample code that will allow you to test your sequence of 1s and 0s. It will run once each time the arduino is powered on. I haven't tested it but it should work ok. Put your delay values that you are figuring out in the _HIGH defines (at the top). The RF sender should be connected to pin 3 on the arduino. Also, make sure to change the standardBits variables to what you have figured out from Audacity. Also, when I was testing I recorded what was sent from my arduino (the above code) into Audacity so I could make sure my timings were correct. This has been very useful, and I have been trying to use the same technique to see if I can control a Hunter Pacific fan that came with a Neoteric remote. Basically, you can use a 433 MHz receiver to sniff the signal without having to use a sound card etc. Would have saved me a bunch of time (but I did have fun trying to figure it out). However, I have now come unstuck as the signal from the remote I have appears to be encrypted in some way as the signal changes every time - each button press results in a different signal being sent. I will continue to see if I can figure it out, but I don't have too much hope. Thanks again for a very interesting project, and taking the time to write it up. @CalvinAndHobbes Thanks for sharing! I had originally tried to use that library to decode my remotes but it did not work. That's why I had to use the sound card. I agree though, definitely try that option first! It would be much easier. I didn't think Hunter fans communicated at 433MHz? I was trying to find a fan control last year that would allow me to integrate with MySensors but they all looked to be communicating at other frequencies (fans were down near 419MHz if memory serves correct). That's exciting that you were able to decode it though! What remote are you using? @BulldogLowell I started out by opening the remote to see if I could find any useful information, and you are correct - they are very simple and should be very easy to wire up a pro-mini inside it. What I don't know is whether I can have 2 remotes on the same fan, as I don't think I will get away (by the rest of the family :-)) with hacking the one we have. It was also an interesting exercise to see if I could figure out what the remote was doing. @petewill I am using the Neoteric remote from Hunter Pacific. Unfortunately they don't have any controllers that you can integrate in to any home automation system. I am going to contact the manufacturer to see if they will help, but I doubt it. @CalvinAndHobbes Yes, that would be nice if they had some integration but doubtful. There is a z-wave controller from Leviton (Leviton VRF01-1LZ Vizia RF) but it's over $100 normally. Too much for me. @petewill I looked at the Leviton controller - but I am in Australia, and they don't make an Australian version (for some reason, Z-Wave in Australia is on a different frequency). And the fans I am using are Hunter Pacific fans made by an Australian company, and that is probably why the remote works on a different frequency. I believe Hunter and Hunter Pacific are different companies - just in case anyone gets them confused. Yes, thanks for clarifying. I was thinking they were the same. I contacted the manufacturer, and they confirmed the protocol is a proprietary one, but they suggested I hack the remote directly, and even offered to send me some remotes to play with, so I am going to go down that route. The remote is very easy to hack too. Wow, that is awesome! Good work! I have a similar challenge, to automate some fans that I have in my house. I didn't have the same luck when contacting the manufacturer. I tried to hack the radio messages using both 433Mhz and 315Mhz sniffers, but they must use a different radio, or I did something wrong. It is relatively easy to hack my remotes and insert an Arduino + radio, however I'm thinking in other aspects before start --- Such as replacing the battery of the remote (currently a single CR2032 cell) , as it will have to be "always on" in order to listen to the gateway. I'm also think in do a 'bi-way' interface, so instead only listem gw and 'press buttons' in the remote, the inserted arduino would also sense if any button is pressed in the remote and report it back to GW. Thanks. I agree, there doesn't seem to be a perfect solution. For my blinds we rarely use the remotes that came with them. That way we don't need to worry about the status being incorrect. I have modified phones placed around the house we use as control panels as well as apps on our phones. But, for the most part the blinds are all controlled automatically by the light level outside. A ceiling fan would be different though I'd imagine. Hi to everyone! Im very (I mean VERY) new at this, and Im far to be a programer or an specialist, Im just an enthusiastic end user willing to do all of you experts do! I have the same problem as Pete had, I have some dooya motors in my blinds and I want to integrate them to my smarthome system. This blinds are controlled by a remote control with 3 buttons, up – down – stop, and they are suppose to be RF, they have awesome range btw (see pics). First I tried the RC-Switch to sniff the RF code, but the program return nothing, just blank, that’s why I came to this, wich I would like to thank Pete for giving a light at the end of the tunel! (which Im still in). Not the same wave structure (squared) but I hope it has nothing to do. @frantona Could you post your entire sketch? Did you measure the signal timing? Hi! Thanks for your answer. Nope, I didnt measured the signal timing. I missed it. How should I do it? I will paste the full code this night when I arrive home, Im using the same one Pete posted few messages back. @frantona Here is a tutorial on figuring out the timing. Pete's sketch uses the timing (length) for the high and low of both the ones and zeros (lines 35-38). Have you tried this with the RCSwitch or Remoteswitch libraries? They take all the guesswork out of sniffing signals although they don't work for all transmitters. [Edit: nevermind, i reread your post where you did say you tried RCSwitch]. What a great thread, thanks @petewill for all of the info. I can't wait to give this a try. After reading through all of this, am I correct in assuming that using the slider control (or programming a controller to open the shade to a certain %) has not been achieved? I was thinking about this a bit, and thought about perhaps using a few cheap magnetic door sensors along the edge of the window at different positions. You could then attach a small neodymium magnet to the back of the bottom edge of the shade that passes by the door sensors. Each of those door sensors could report a value back to the controller, indicating its position (ie 0,25,50,75,100), and if the MySensors node receives a slider value from the controller, you could round to the closest value, and raise/lower the shade until that value is achieved. I'm a complete MySensors/HA/Vera noob, so please excuse my ignorance if this is a ridiculous solution to a simple issue. @Mike1082 You are correct. Slider control hasn't been achieved. I have thought about doing something like this but I haven't had too much of a need for it in the 1+ years I have had the blinds. Usually up or down is all I want. The one problem I could see with doing this is you will need some sort of device placed at the blind. Currently all you need is power (battery or hard wired) and this works. If you want to report values back, you will need another sensor there. Not a deal breaker but not ideal. Also, you would need a way to confirm that it stopped (in case the signal didn't get received from the blind). If you are seriously considering doing this you may want to look into using a reed switch and mounting it on the spindle that turns when the blinds go up/down. That way you get a cleaner install with more frequent updates. I'd love to see it if you end up doing it. It would be a fun project! What kind of battery is powering the blinds.com motor and its receiver? From looking at your video, it appears the blinds.com receiver is constantly listening, and having a receiver constantly listening 24/7 all the time can take quite a lot of power (or, at least it would if it were using an NRF24L01+ or an RFM69, although I of course realize it isn't using either one of those). Blinds.com says it can take a refillable "wand" that gives 12 volts. So, would that be 8x D-cell batteries? Do you find that you need to change the battery in the receiver often? Just trying to get a feel for what it would take to be listening 24/7. @NeverDie Thanks! It is powered by 8 AA batteries in the battery wand. I actually hardwired mine though. I was able to get power to all my windows fairly easily (although my wife would disagree). So, unfortunately I have no idea how long they last. I feel like I remember people reporting about a year but I can't say where I remember that from. Your code has an error in the 'action' section of the sketch. does anyone know a (cheap) way to add a motor (that could be controlled by mysensor) to existing blinds? In theory you would only need a small motor I guess, but I am unsure how to connect that to the blinds..
there is an other way to control your shutters. It´s itegrated in FHEM. There are also the decryption at the shuttersignal. All 40 Bit and the explain to the 40 Bit. @Rantlers Sorry for the delayed reply... busy day back at work. Hmm. Did you zoom in on the audacity waveform? I had to zoom way in. If that doesn't show anything it may be that the remotes are at a different frequency now. That looks different than mine. Is there any indication which frequency the remote is on? Also, I was able to actually hear the signal on my speakers when I played it back. It sounded like high pitched digital noise. Do you hear anything like that? @petewill Hi Pete, thanks for the response, no worries on the delay! I zoomed in every time I created a new recording, but I could never find a distinguishing pattern like the ones you had. Funny, I did suspect that the frequency from the remote could be different so I have a 10pk of 315mhz tx/rx coming in tomorrow. I'll be rather embarrassed if its as simple as that, but pleased at the same time! I listened to the playback in your youtube video a few times and the strange thing is it almost sounds like I'm getting static and digital noise throughout the entire recordings, regardless of whether I'm pressing buttons on the remote or not. I honestly don't know of anything that would be constantly spitting out a 433mhz signal though. I'll post an update after I get a chance to try the new receivers. @Rantlers Yeah, see if you can find what frequency that remote is communicating on. There must be some specs some where on the remote. @Rantlers Dang! That's too bad. Are the blinds blinds.com brand or Hunter Douglas? I just want to make sure they didn't use a similar remote style but change the frequency. The NRF24 is what most of use for these projects so it might not be bad to order some to test. I'm not an expert on radio though so it may not be as easy to "sniff" the signal. I know @Yveaux has built a sniffer but that may only work for the MySensors network. Sorry I can't be more help! It will only work for nRF24L01+ chips. It isn't limited to MySensors. Are you sure you have the economy shades? Ive noticed they have disappeared from Blinds.com, or at least I don't see them anymore. I just confirmed with Blinds.com online chat that the economy blinds aren't available anymore, or at least for now. They stated there was a defect in the motors, so they had to pull the product and work on a redesign. No timeline on a release. Thanks!!! 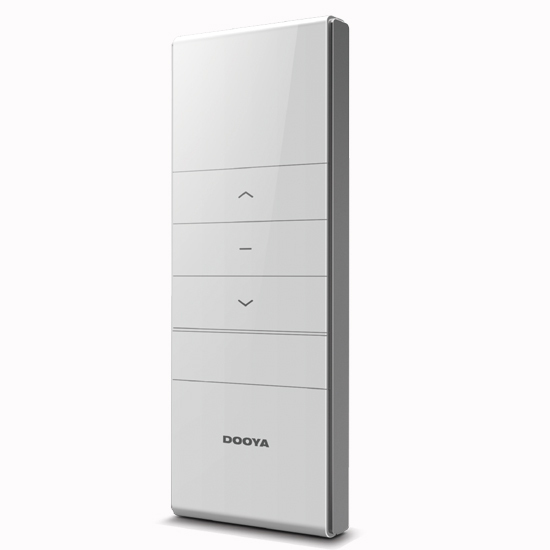 this was such a great help in getting my dooya blinds from aliexpress working over network. I couldn't get the test code above to work and my sequence was 40 bits, so i modified the code quite a bit and made it much more efficient. Here is the code if anyone needs to test their code on arduino. delayTime = ((int) code1) -48;        // 48 is zero in ASCII, so 48-48 = 0 as a number. I had use USB Saleae Analyzer sniff code. @かいと please do not cross post. If people can help you they will respond. Be patient! @かいと The pattern for the control may have changed...? Because you have a recording of the remote I would try to record what you are sending with your transmitter and compare the waveform of the two devices. They should be identical. That is how I ended up figuring out the exact timing needed for my motors. We have a holiday home in Spain and it has some external 'awnings' that extend over the windows to provide shade from the sun. In Spain these are called Toldos. They operate using tubular motors controlled using 433MHz remote controls – one remote for each awning, three in total. I'd tried all the regular methods to sniff the 433MHz protocol, but none of the standard Arduino libraries would even acknowledge that the remote was sending out any sort of signal. Other remotes, such as garage door openers, PIR detectors etc work fine with my sniffer, so the hardware/software I was using is good. I eventually resorted to using my sound card and Audacity software to capture the transmissions from the remote controls and this work surprisingly well (I'd tried every digital approach you can imagine up to this point, including a logic analyser, and was reluctant to try the analogue approach but wish I’d trued it earlier). What I discovered is that when I press either the UP or the Down buttons on the remote, it transmits a timing pulse followed by 40 bits of data. At first I thought that this sequence was repeated 8 times, but I eventually realised that one 40-bit code was used for the first 4 repetitions of the data, followed by a different code for the next 4 repetitions. I later realised that whenever one of these buttons is pressed, the initial 40 bit code is transmitted continuously then the other code is transmitted 4 times when the button is released. When the button is pressed quickly I just get the 'Pressed' code 4 times followed by the 'Released' code 4 times. The Stop button works slightly differently - only one code is used and this is transmitted at least 4 times and will continue to be transmitted as long as the button is pressed. (in other words, the Stop button has a 'Pressed' code, but not a 'Released' code). It's actually the 'Pressed' code for each button that controls the awnings. The 'Released' code doesn't seem to serve any function with my awnings. These 'Released' codes really confused me to begin with, as I when I checked two different bursts of data from the same button using Audacity, I was getting different results. This was obviously because on one occasion I’d picked one of the ‘Pressed’ codes to analyse, but on the second occasion I’d inadvertently analysed a ‘Released’ code. At first I’d thought the analogue capture process was unreliable, but then I thought that maybe some sort of rolling code system was being used. I eventually realised what was going on, but not until I'd spent quite a bit of time cursing the remote control and the PC. I’m repeating the ‘Pressed’ code 4 times and it seems to work very reliably. As well as being able to control the awnings using an Arduino/ESP8266 transmitter, I also wanted to be able to use the existing handheld remotes, so to be able to understand the current position of each awning I needed a way of receiving the commands from the remotes and using them to keep track of each individual awning. This bought me back to the original problem of not being able to find a way to listen to the 433MHz messages from the remotes using any of the current Arduino libraries. It has an Arduino sketch that is written to identify the codes that are being transmitted by remote controllers for blinds, so that these codes can then be used to control the blinds using a Raspberry Pi. When I ran the Arduino sketch it immediately produced results from my Awning remotes – If only I’d found this earlier! The results it gives are in a “Quad Bit” format, but when I modified the code to print out the raw received codes they were identical to the results I’d obtained from Audacity. I’m not interested in using a Pi to transmit the codes to the blinds, and this wasn’t needed anyway, as using @peashooter's code I already had a transmission solution. I’m now in the process of fine-tuning the code that tracks each blind’s position based on the commands that are sent from either the hand-held remotes or my transmitter. The position is simply based on time between the start and stop transmissions and the known time that it takes to fully extend each awning. The primary reason for wanting to control the awnings is that when it gets windy, I want to be able to automatically retract them. I’m using data from a weather station to monitor the wind speed and if it meets the criteria (very strong winds for a short period, or not quite so strong winds for a slightly longer period, then the awnings will be retracted (assuming that they’re extended of course). I’m also automatically retracting them when it gets dark, as it’s easy to forget to do this and a bit cumbersome to walk around and do all three awnings using the separate hand-held remote controls. The brand name on the remote is Gaviota and the circuit board says “Designed by D Team” “DC104/105” “V2.1” and “No.DA288”. I have no idea what the brand name is on the tubular motors, as they’re hidden inside the mechanism. Hopefully this saves someone at least some of the pain that I’ve been through to get to this point. I stumbled upon this when I realised that my Debel awning was using a Dooya motor and remote. Just wanted to point it out for others looking for RF codes for Debel awnings. @mortenvinding cool! I looked at a couple of code "sniffers" when I did this but none of them worked. Good to hear progress has been made on that. Should save quite a bit of time.